Offshore Wind Energy Market size was witnessed an annual installation of over 4 GW in 2017 and is set to exceed USD 60 Billion by 2024. Growing attention towards replacement of conventional power generation technologies that involve extensive utilization of fossil fuels to limit GHG emissions will drive the global offshore wind energy market. In addition, sustainable offshore energy potential coupled with favorable regulatory inclination towards optimum extraction of energy resources will positively sway the industry dynamics. The government of China announced a new action plan in 2016 to restrict emission level to 18% by 2020. High electricity prices, space constraints for solar energy and onshore projects coupled with reduction in construction and installation costs of offshore technology will boost the offshore wind energy market. Positive industrial outlook towards the development and integration of large turbines coupled with advancing blade size, turbine efficiencies and foundation techniques will further augment the business landscape. Offshore wind energy market from turbine is anticipated to expand over 17% by 2024. These units account for a large portion of the total project cost which play a pivotal towards plant performance and feasibility. In addition, continuous developments in turbine size for offshore installations, new blade designs, emerging turbine assembly concepts and innovative drive trains are some of the key factors strengthening the product demand. Introduction of superconducting generators, variable transmission devices and improved generator speed control are few advancements restructuring the electrical infrastructure across offshore wind energy market. Technical developments in the construction of efficient cooling systems and use of high voltage AC array cables will further complement the industry outlook. < 100 kW offshore wind energy market is predicted to surpass annual installation of 500 MW by 2024. Continuous development of co-generation units to support energy and heat utilization across small commercial, industrial and off-grid networks will boost the product adoption. Ongoing technological advancements for improvement of re generation units to sustain low energy requirements will further stimulate the product penetration. Increasing adoption of distributed generation technologies across the prevailing energy applications will enhance the > 2 MW offshore wind energy market growth. Light weight, fewer moving parts, lower emissions, compact size, and lower costs are some of the key parameters driving the installation of these products. In addition, improvements in efficiency & flexibility across recuperated and un-recuperated systems will further propel the business landscape. Fixed installation, in 2017 accounted for majority of the offshore wind energy market share owing to improvement in seabed characterization and advanced project design software. In addition, implementation of LiDAR technology will help in reduction of turbine installation costs, which in turn will further complement the business outlook. Rising demand to discover the potential of high speed wind resource in deep waters along with standardized foundation designs and readily available installation vessels will enhance the floating offshore wind energy market. 0 – 30 m water depth, offshore wind energy market is anticipated to grow over 14% by 2024. 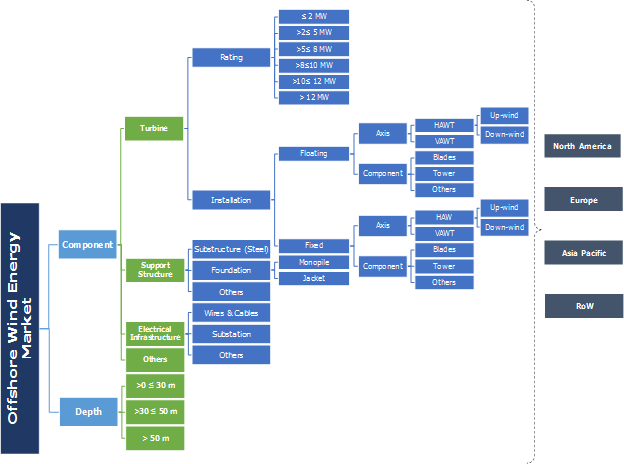 Increasing usage of monopile and tripod type foundations in the shallow water regions along with superior transmission and grid connectivity opportunities will enhance the construction of offshore farms in 0 - 30m water depth sections. Rising trend witnessed in tapping the less turbulent energy far off the coast will enhance the > 50 m offshore wind energy market. Immense possibilities offered by floating and gravity-based structures (GBS) will further eliminate the depth constraints. For instance, to develop new offshore designs in deep waters of the Atlantic, Deep North Sea and Mediterranean Sea, the regulatory authorities are focusing on the development of supportive legislative framework. The U.S. offshore wind energy market is anticipated to expand over 1 GW by 2024. Discovery of new potential sites coupled with significant investment to scale up offshore supply chain will drive the industry landscape. For instance, in April 2018, US Business Network for Offshore Wind, in aggregation with a French multinational financial service company, Société Générale, held workshop with offshore energy experts to improve investment into the US offshore sector. Europe’s offshore wind energy market will witness growth on account of favorable government regulations, decarbonization reforms and energy security initiatives. Increasing investments by leading companies to explore the offshore potential will further drive the industry landscape. According to Wind Europe, the industry invested about USD 59 billion in Europe, with investments coming from public market transactions, new assets and mergers at project levels. Notable industry players across the offshore wind energy market include Enercon, Vestas, GE, Nordex Acciona, Siemens Gamesa, Senvion, MHI-Vestas, Goldwind, United Power, Envision Energy, Suzlon, Mingyang, Wobben, WEG SA, Impsa, Clipper, Bergey, LM, Enessere, Northern Power Systems, RTS, Global Energy Services, Availon, Prysmian, General Cable, Furukawa Electric, Southwire, Nexans, LS Cable, and Sumitomo. Offshore wind power involves generation of carbon-free sustainable energy by harnessing the power of sea winds through established farms on the water bodies. The power generating turbines are usually installed on the continental shelf or at the potential oceanic sites.